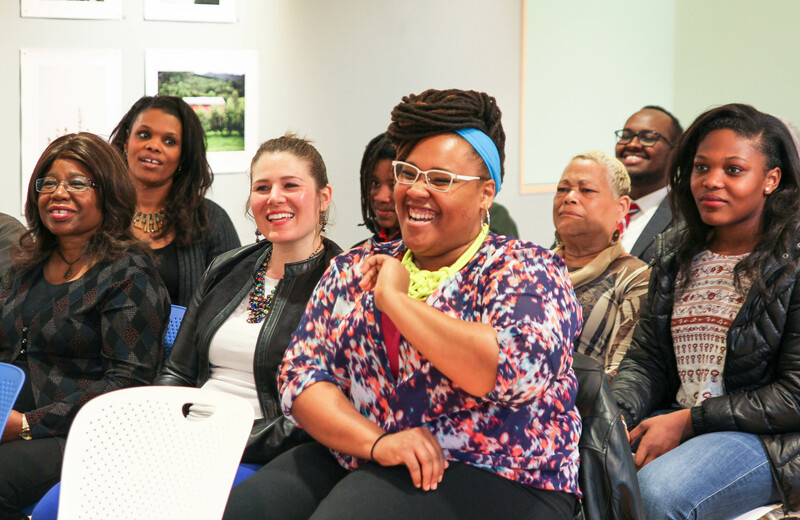 Nexus Community Partners is excited to announce that we are recruiting a diverse group of 8-10 dynamic leaders from Black Indigenous and People of Color (BIPOC) communities for our 2019 Cooperative Development Fellowship Program. The seven-month program is targeted at individuals/consultants who would like to become cooperative developers, organizations wanting to add cooperative development to their services or incubate a cooperative, and other professionals (e.g. lawyers, capital providers) who are interested in supporting cooperative development. We are also interested in recruiting applicants who will focus on assisting business owners and their employees who want to convert to worker ownership. Please note that the Fellowship is not designed for individuals wanting to start their own cooperative. Coaching and support from Nexus and DAWI. All training, coaching and off-site travel expenses will be covered by Nexus. The Fellowship requires a time commitment of between 75-85 hours over the course of seven months, with participation in all program activities mandatory. A timeline for the program is available in the application below. Applications are due February 25, 2019. Please visit this link for our online application. Before you complete the application, we request that you attend one of our information sessions. You’ll get the chance to learn more about the Fellowship program and ask questions. In the event you are unable to attend, we can schedule a short one-on-one phone call. Click here to view the dates and location of the information sessions. Please contact Nkuli Shongwe at nshongwe@nexuscp.org to register or schedule a call. 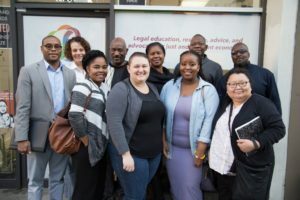 For more information contact program officer Elena Gaarder at egaarder@nexuscp.org or community wealth building coordinator Nkuli Shongwe at nshongwe@nexuscp.org. 2018-19 North Star Black Cooperative Fellowship has Started Off Well! North Star Black Cooperative Fellowship 2018/2019 cohort sessions have started off well! The first cohort meeting dug into the history of cooperatives and the society in which we live in that bread a necessity for cooperatives to exist. We also discussed how modern-day society makes it difficult for black businesses to remain afloat without systematic structures trying to tear them down. Our second session dove into the role capitalism plays into the overall success of a cooperative economy and the need to bring it to fruition. And our most recent cohort session dissected the cooperative bylaws and development – what makes cooperatives successful and what foundations are necessary for keeping the cooperative stable. It asked a difficult question: what is most important to the board – profit or the people? Through this, many of the members revealed the ingrained roots of capitalism and have continued to tackle the multilayered issue of social inequality with curiosity and understanding. The pessimism that surrounds our community due to the weight of social inequality can be back breaking, however, this is only true if you allow it to consume you. Pakou Hang, 42, was born in Thailand, but she’s been an American for all but two weeks of her life. Hang, the child of Hmong refugees resettled in the United States and grew up in Wisconsin, where her parents supported the family by farming. 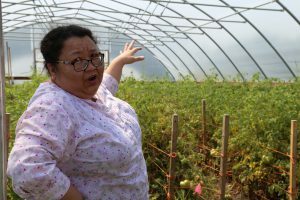 Today, that history deeply informs Hang’s own work: She’s co-founder and executive director of the Hmong American Farmers Association (HAFA), headquartered on a 155-acre research and incubator farm 15 miles south of St. Paul, Minnesota. Facing persecution as U.S. allies in the Laotian Civil War and the Vietnam War, more than 100,000 Hmong refugees have relocated to the United States since the 1970s. They brought their agricultural prowess with them. In past decades, Hmong-American farmers helped to pioneer the contemporary local food movement in California and the Midwest, popularizing ingredients like Thai chili peppers and bok choy; today, Hmong farmers account for more than half of the produce sold in St. Paul’s farmers’ markets. Founded in 2011, HAFA helps to sustain that legacy by providing pilot plots, professional training, and a food hub—the key piece of processing and distribution infrastructure that makes doing business possible. Hang spoke about her upbringing, her childhood resistance to the farm life, and why she decided to come back home and make agriculture her calling and career. We are so proud to call Pakou a partner, and are excited to see the continued growth and support for HAFA and Hmong farmers both locally and nationally! Cheers to you Pakou!! 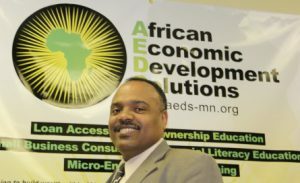 Entering the African Economic Development Solutions’ (AEDS) office in St. Paul, Minnesota, visitors are instantly greeted with bright-colored, floor to ceiling banners displaying African pride and the work of AEDS. Founded 10 years ago by Gene Gelgelu, president and CEO, AEDS supports wealth building in communities, with an African-centric focus. In its early years, AEDS provided wealth building through business planning and youth enrichment programs. Over the years, with the help of Nexus Community Partners and others, the work has expanded and evolved. “We were able to start our loan program in 2013 with the help of Nexus and the grant we received. We have expanded the program so we are able to do micro-lending for businesses, financial literacy, and credit placemaking [in the Twin Cities-Metro area],” Gelgelu said. Through the various programs, African Economic Development Solutions impact can be felt and seen economically, physically, and socially. When Gene first founded AEDS, it was not the large, vibrant office space it currently is. For the first couple years of the organization, Gene was sharing a desk with another organization and could only give himself part-time pay, though he was working far more than the standard, 40 hours a week. The relationship between Nexus and AEDS dates back to 2010, when Nexus gave the organization a $10,000 capacity building grant to develop and strengthen their asset and wealth building programs. “We trusted Gene’s vision and his ability to address the needs of his community,” said Danielle Mkali, Nexus program officer. Over the years, Nexus provided funds to help AEDS communicate their story, attract additional resources and expand its programming. Today AEDS is a Community Development Financial Institution (CDFI), and in 2017, the organization received a $150,000 award from the Small Business Administration. “Gene is helping families build a legacy. It has been a pleasure to witness AEDS overcome barriers and watch the organization grow. We have learned so much from AEDS,” said Danielle. Reflecting on next steps for AEDS, Gene wants to build out the lending program, expand benefits for existing staff, and strengthen organizational capacity; however, he also wants folks to remember how African communities are important to the Minnesotan fabric. Nexus Community Partners and Village Financial Cooperative held the first annual Blackonomics Conference. The two organizations brought together over 60 people from the Twin Cities, Denver, Oakland, and Chicago. Blackonomics is an intentional gathering of Black folks in the Twin Cities and the Midwest that are working towards Black cooperative economics and solidarity economics. The weekend kicked off Friday evening with a welcome dinner where we enjoyed incredible food from Chelle’s Kitchen. The air was filled with joy and celebration. The space was blessed by Amoke Kubat , a write, artist, teacher, Yoruba priestess and community elder who took part in Nexus’ North Star Black Cooperative Fellowship. After dinner, we had a fish bowl conversation about cooperation, healing, and Blackness. One of the participants from Chicago was moved by the conversation and suggested that we needed to actually give money to the cause. He spontaneously pulled out a $20 bill and threw it on the ground. This prompted people to dig into their wallets and give what they could to the cause. By the end of the night people contributed over $180. Saturday morning we had incredible breakfast from K’s Revolutionary Kitchen. After breakfast, everyone sauntered off to the three different morning break-out sessions. Danielle Mkali led a session about the steps of cooperative development. LaDonna Redmond Sanders and Makeda Toure led a session about the cooperative principles and values. I led a session about the historic and present local, national, and international BIPOC cooperatives. During lunch, we had the opportunity to learn about Mandela Foods Cooperative from the keynote speaker, Adrionna Fike. Adrionna is a worker owner of the BIPOC grocery coop in Oakland, California. Adrionna told the story of she found her way to Mandela Foods Cooperative, gave some history about the grocery store and the journey they are taking which included freeing themselves from a disempowering relationship with Mandela Marketplace, hiring more worker owners, and forgoing moving to a larger space which used to house the 99c store. After the Keynote, we had the last breakout sessions. Isaiah Goodman led a session about Becoming Financial, Renee Hatcher, a human rights and community development lawyer, led a session on the legal basics of starting a co-op, and Julia Ho and Salena Burch led a session an building solidarity economies. After we adjourned the day, we headed to Coop Fest which was led by Cooperative Principles, a co-op investment club. We celebrated cooperating and had the chance to donate to up and coming co-ops incubated by Minneapolis’ C-TAP program, Women Venture, and Nexus’ North Star Black Cooperative Fellowship. Each group gave a brief presentation about their cooperative and stated how much money they needed. There was a lot of excitement and jubilation in the air. At the end of the night, people donated money to the coops they were most interested in and the ones they supported. Blackonomics came to a conclusion on Sunday. We spent the morning envisioning what cooperation would look like 30 years from now. 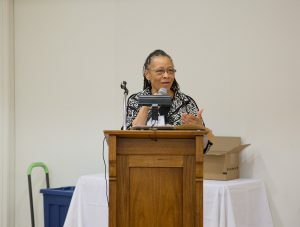 Dr. Rose Brewer, a professor of Afro American and African Studies at the University of Minnesota, and Irna Landrum, a digital campaign director at Daily Kos led us through and activity about how we would build, maintain and develop and Black solidarity economy in the Midwest. After a lot of robust conversation we decided to build out our networks and invite more Black folks to our movement. We then identified who wanted to take initiative and be part of the planning process for the next Blackonomics conference which would be bigger than and just as amazing as the first one. We ended our day by expressing our gratitude of being in the space and how we felt after the long yet rewarding weekend. Blackonomics was a beautiful, melanin filled space, that provided healing, hope, love, warmth, joy, and community. For more than 15 years, Nexus Community Partners has been dedicated to building more engaged and powerful communities of color. Through the work of BCLI, Nexus has continued to build sustainable and replicable models for community engagement and community orientated leadership development that strengthens communities. The BCLI is a seven-month leadership program designed to identify, train, and support placement of dynamic leaders of color and underrepresented communities onto publicly appointed boards and commissions in the Twin Cities. BCLI fellows help advance a racial and economic equity agenda across several sectors and issue areas. Carmeann Foster, nominated by Rebound Inc. The BCLI continues to build momentum within local governing bodies by creating opportunities for community members to become active decision makers. 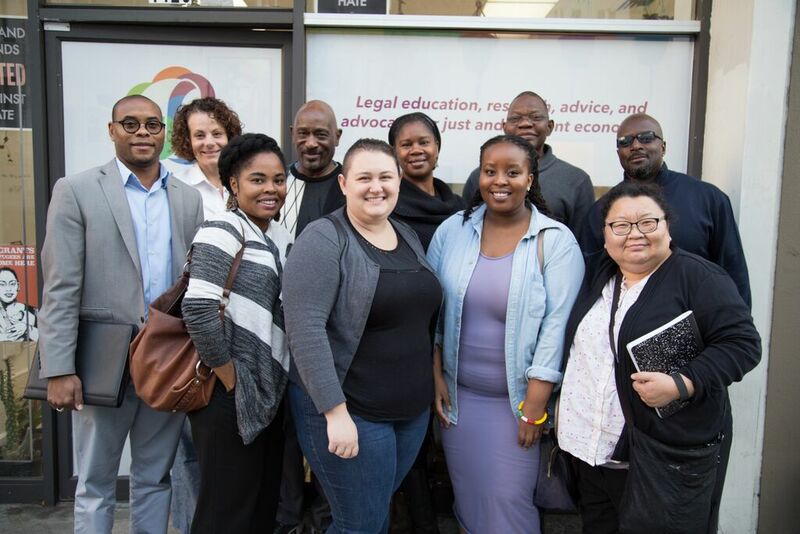 The incoming BCLI fellows join a network of 69 alumni, 38 of which have to date been successfully appointed on a board or commission or hold a high-level policy position, and all of whom are building and pushing racial, social and economic equity in the community. Biographies of each fellow can be found on Nexus’ website here. For more information about the BCLI, the launch or ways to become involved, please contact the program director, Ms. Terri Thao at tthao@nexuscp.org or program coordinator Mr. Chai Lee at clee@nexuscp.org. You can also check out Nexus’ website: www.nexuscp.org. See below for an infographic of the 2018-19 BCLI cohort’s demographics. BCLI Releases 2018-2019 Nomination Packets! Nexus’ Boards and Commissions Leadership Institute (BCLI) is Now Taking Applications for the 2018-2019 Cohort! Nexus Community Partners is proud to announce that we are now seeking nominations for our sixth cohort for the Boards and Commissions Leadership Institute. The BCLI is a 7-month cohort leadership program that supports, trains and helps places people of color and other underrepresented community members on city and county publicly appointed boards and commissions that influence and impact equity in the Twin Cities Metro Area in economic development, health, housing, transit and workforce development. In the past five years, The Twin Cities BCLI has trained 69 alumni, half of which have gone on to serve on boards and commissions at all levels of the state (local, regional, and state). We are excited to be recruiting a new cohort of leaders dedicated to equity work in the region and hope you will help us spread the word to friends and networks who want to be a part of a network of leaders on boards and commissions! We are pleased to add two new geographies to our nominations packet this year: welcome aboard, Roseville and Woodbury! Moving BEYOND A SEAT at the table TO A VOTE in the decision-making process. Please join us for the following Info Sessions to learn more about the nominations process and the program! Nexus BCLI Graduates its 5th Cohort! 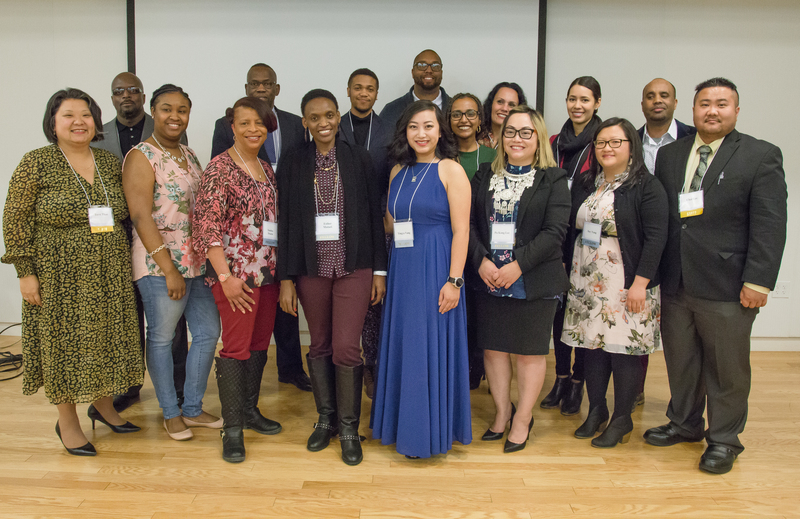 On Thursday, April 5, 2018, the Nexus Boards and Commissions Leadership Institute (BCLI) graduated 14 fellows from its fifth cohort to a room filled with over 75 friends, family members, nominators, alumni and supporters. Commissioner Carter’s words were followed up with comments from two graduating cohort members, Jasmond “Jay” Rathell and Yingya Vang. Jay spoke first, and he highlighted the impact of BCLI being a safe space where people of color (POC) leaders could really learn and dig deep into policy issues together. He found inspiration in the esprit de corps which the BCLI fellowship provided, and announced that he was intending to take his leadership to the next level, and would run for city council in his City of Robbinsdale. Yingya spoke to the importance of strengthening a network of peers and colleagues dedicated to the ongoing work of racial equity, and how motivational it was to be a part of movement to put equity champions at the decision-making tables. After the speakers, the 14 graduates were acknowledged in the official commencement ceremony and given certificates and stipends for their participation. As in similar years, graduates were gifted with a poster from local artists/organizer/elder Ricardo Levins Morales who spoke at the October 2017 launch of the program. This current cohort hails mostly from the East Metro, with seven St. Paul residents and a few from eastern suburbs. Fellows came with diverse backgrounds and from across sectors. They ranged in age from 23 to 58, averaging age 35. This year’s fellows had interests in seats at all levels of government from local and regional to state, examples include city budget boards to county health services and state-wide ethnic leadership councils. The BCLI at Nexus is proud to graduate 14 more alumni into its network of leaders, making a total of 69 Twin Cities BCLI alumni, over half of whom have served at or currently serve in appointed boards and commissions at all levels of government in Minnesota. Stay tuned for more information as the BCLI works to recruit its next and sixth cohort this May. Click here to learn more about Nexus’ Boards and Commissions Leadership Institute. This program has been adapted from the Boards and Commissions Leadership Institute originally created by Urban Habitat in Oakland, California. In a recent Next City article titled “City Halls Now Hiring for Community Wealth Building,” Reggie Gordon lifted up community wealth building as a strategy that cities across the country are beginning to invest in. Reggie Gordon is the director of Richmond’s Office of Community Wealth Building, the first of its kind in the nation. As he says, minorities all too often suffer from high unemployment or are pushed into low quality, service-sector jobs that don’t give them the opportunity that they need. Check out how Community Wealth Building is gaining momentum around the country!